A fixture that was in jeopardy on Friday due to late drop outs, including the author of this report, was fulfilled due to some much appreciated assistance from those who played in the League the previous day, and a highly entertaining game was played out where all results were possible going into the closing overs. Batting first at the invitation/request of the visitors, Peter Phipps and Alistair McMillan started cautiously against Jenkins, (5-2-13-0), and Knew who would go on to bowl his eight over allocation in one go, returning figures of 8-1-28-0. There were more scoring opportunities from the change bowlers, and once the opening stand had passed 50 in the 16th over; McMillan, (61), scored his last 32 runs off just 14 balls including two straight sixes over the sightscreen at the Railway End. During a seven ball 17th over one of his eight fours took him past 13,000 runs for the Club. The opening stand of 97 was broken in the last over before drinks when McMillan hit M.Gordon to mid-wicket; bringing James Trower to the crease. Trower got useful time in the middle and hit the better bowling well; and with Phipps looking to be more expansive after reaching a half-century of his own, Stoke were very well placed at 149 for 1 in the 30th over as lesser bowlers were given their chance. Phipps checked out on 60, (89 balls, 8×4), when he was bowled by sixth bowler Waldron, who then castled Trower for 44, (39 balls, 8×4); picked up Chris Finch who skied one for 2, and Thomas Dennis bowled for 10. The latter two batsmen were unselfish in the pursuit of quick runs; a straight driven four by Dennis a particular highlight of his batting effort. 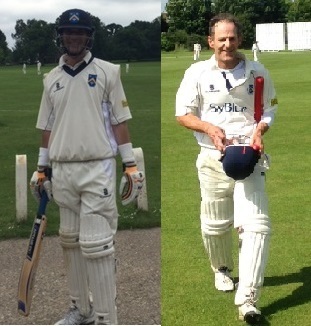 Will Yeeles, (7 not out), and Geoff Vinall, (2 not out), ran a few singles in the last couple of overs to close the innings on 197 for 5. Waldron finished with 7-1-17-4. Jo kindly produced a great tea for the second day running, and after seeing that off Stoke took the field looking for their first Sunday XI win of the season. Adrian Mills got Stoke on the board early when Curtis drilled one to Rod Thomson attempting a repeat of his only scoring shot; but despite a tight six over spell from Dennis, Darrell Pitts played positively and the visitors passed 50 in the 13th over. Ian Hopton bowled No.3 Smith for 10, (no shot offered), to make it 62 for 2 at the end of the 16th, but the visitors were handily placed going into the last over before drinks. Pitts didn’t make it to the break or his half-century, though, as he gave Hopton a second wicket, checking out on 47, (9×4), when he failed to clear Thomson at mid-off. The sides took drinks at 97 for 3, Vinall having got through four tidy overs at a personal cost of just 13. No.5 Cochrane was ‘given a game’ and gave Thomson a return catch during his mixed three over spell; but an exploratory over from Yeeles that necessitated very small writing in the book to get all the deliveries in, left 68 needed from the last 13 with some good batsmen still in and still to come. Shawn Dyson, another who helped complete the XI late in the week, gave the gloves to Phipps and delivered five overs of spin that brought/bought, (either word applicable), the wicket of Mark Gordon who was bowled for 20. 138 for 6 was soon 140 for 7 when Dennis returned to complete his allocation. His last two overs went for just four and the penultimate ball dismantled Waldron’s furniture. The award for the most economical figures on the day, (8-2-18-1), goes to him. Were this a timed game, many sides might have thought about shutting up shop here, but Knew and Jenkins, (the latter who struck the ball cleanly to win this fixture last year), scored runs at the required rate to set Thomson a poser with his bowling choices as there weren’t some of the usual faces in the line-up this week. He bravely opted for McMillan’s grenades and the inspired choice brought instant reward when Knew, (17), holed out in the deep. Dennis showed good hands, and an even greater presence of mind to keep his feet inbounds. 155 for 8. Jenkins needed someone to stay with him. No.10 Cibardo seemed to hold on for long enough despite the best efforts of the returning Mills, to nudge the equation more in the visitors’ favour; and things then looked very good for them when the returning Hopton was planted into the houses…but the game swung again off the last ball of the same 38th over when Hopton, (7-0-36-4), got Cibardo’s wicket courtesy of a juggling catch by Dennis. 180 for 9. 18 needed off the last two overs. The highly successful day all round was completed by the visitors staying back a long time afterwards to make a generous contribution to the bar takings. We look forward to this one next year. Next week, Stoke host Wisley. In 2015 we completed an ambitious re-build of our clubhouse at a cost of £250,000. We managed to raise £215,000 and obtained the balance of £35,000 in the form of a 7 year interest-free loan from the ECB. We have to repay £1,250 every 3 months. Our ambition is to clear the debt as quickly as possible, so, if you’d like to help, please click on the button below to make a donation. We have charitable status, so we can reclaim 25p from the tax man for every £1 that is donated.